Remote Geosteering | Silver Spring Energy Consulting Ltd. The term “geosteering” has been used colloquially in the industry to describe a process by which the geologist either in the field or in an office makes adjustments to wellpath targets using geological or geophysical data collected during operations. It is typically seen as an alternative drilling method to having the drilling and engineering department follow a predetermined wellpath set out by the preliminary geological work. For our purposes, geosteering is more specifically defined as a process that enhances the intelligence the geologist in charge has access to, in order to improve the process by which they make adjustments to well targets. Geosteering is not a replacement for well logging using striplogs and samples. It is primarily a directional drilling tool to optimize wellpath placement. That said, it has marked improvements over older methods of steering a well. Geosteering software allows the real-time plotting of formation top structure while drilling without having to encounter the formation top directly. There is of course inherent error in this and many assumptions that cannot be overcome without a true top encounter. However, by using the log signature of the formation being drilled it is possible to locate the wellbore in a stratigraphic location within the formation. Using this information, and assuming a constant thickness between the formation top and a given log signature the formation top can be projected to the bit depth. This allows for the geologists to not only steer clear of the formation top or bottom before encountering it, but also allows for the synthetic surface to be used to enhance geological models of the area for follow up wells. While drilling, it is often difficult to identify fault structure when it is encountered. Particularly in zones with repeating lithologies or multiple fault zones. If the gamma curve needs to be manipulated too abruptly to form a solid fit, geosteering software may also model faults to help find a match. Not only is the fault identified more easily, but its displacement vector is measured directly. SSEC uses 2 primary geosteering packages. Our preferred software platform is StarSteer by Rogii Inc. StarSteer is an industry leader in geosteering and provides a robust toolkit to generate meaningful intelligence by which to steer a well. For lower priority geosteering, we are in the process of evaluating the Perspective software package from Wellsight Systems. StarSteer directly applies modern geosteering principals to generate a real-time formation top set while drilling based off of log response. It uses and advanced correlation methodology to match gamma, resistivity and other geophysical log responses to minor variations in trend within a target formation. By manipulating the gamma curve in a True Vertical Thickness (TVT) track, small variations can be matched to similar responses and the stratigraphic location of the drill bit may be precisely located. The output of this manipulation is an adjustment to the apparent dip of the formation set, allowing the geosteering geologist to make wellpath corrections before they encounter either the top or the bottom of the target formation. This methodology essentially allows the geosteering team to “look ahead” of the drill bit and make gradual course corrections rather than reacting to major changes in the formation. This results in reduced wellpath tortuosity and increased drilling performance. Wellsight Systems is one of the leaders in geological striplogging software in the WCSB. Their Starlog suite of programs allows for the rapid creation of geological striplogs and lithology logging for both drill cutting analysis and core logging. Recently they have introduced Perspective as their answer to geosteering and advanced well reporting. 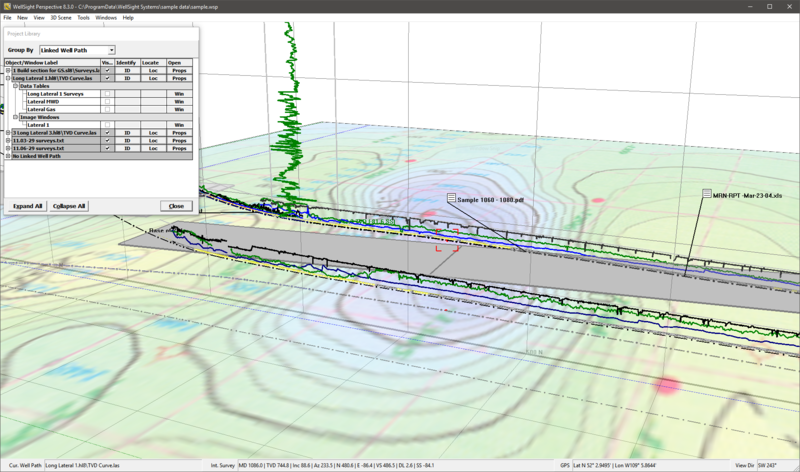 This software package integrates tightly with the Starlog suite of software packages and makes an excellent choice for a geosteering secondary workflow on the wellsite. MWD logs, surveys and even lithological information can be directly imported from a horizontal striplog while drilling, reducing duplicate workloads for the on-site geologist. It uses a more rudimentary method of log correlation and is not well suited to fast drilling where decisions are being made by the geosteering model. However, it is an excellent choice when previous wellpath adjustments need to be verified or to compare offsetting wells with the currently drilled well. Geosteering via remote data link is rapidly emerging as an effective method to place a wellbore in a target formation while realizing cost savings and improved drilling and production performance. Remote geosteering is performed by trained and experienced geologists from a location other than the drilling rig site. This is commonly at either SSEC’s own offices or in-house at a workstation set up by the client. Our geologists work in teams of 2 to cover the 24-hour drilling schedule. We typically have 4 geologists assigned to a workstation to allow for a 1 week on, 1 week off rotation. 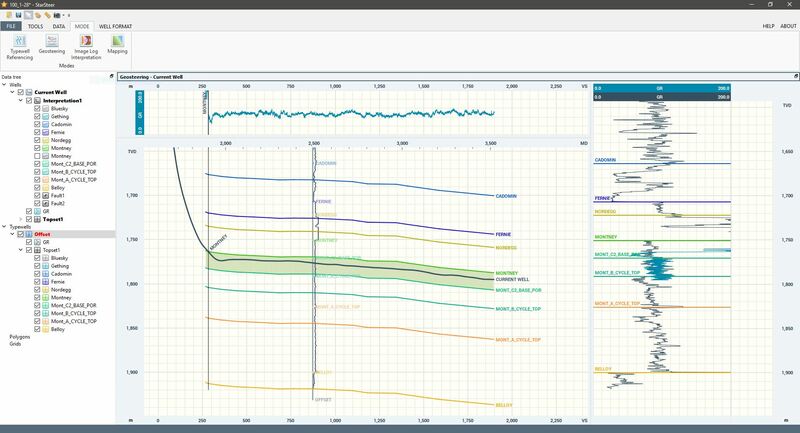 For wells with few expected steering challenges, such as multiple well pads with minor structural variation or large target windows, our geosteering teams can monitor up to 6 rigs simultaneously. This increases cost savings when the chance of a mission-critical geological change is extremely low. In areas of increased complexity, we discuss with our clients the level of challenge they expect and the level of attention they require per rig to develop a service plan that exceeds the project requirements. Geosteering can also be applied on-site alongside traditional wellsite geological supervision to increase the business intelligence provided to our clients. Geosteering methods provide a unique analytical methodology that help field and office staff determine how to steer a well prior to encountering an undesirable formation change. In a Geosteering Primary situation, the wellsite geologist spends most of his/her time actively involved in geosteering the well using geosteering software. Sample analysis and striplog creation are completed during non-active time or when sample analysis is required to confirm the steering decisions arrived at using geosteering software. In a Geosteering Secondary situation, the wellsite geologist performs his/her duties in a more conventional way. Geosteering software is used to confirm what samples, gas, gamma logs and drilling parameters are telling the geologist, but decisions are not made specifically using geosteering software. In this case, geosteering is usually done when the geologist has free time rather than in real-time. Some clients still require a full wellsite geologist on location, particularly in challenging regions. In these situations we offer a range of solutions that combine wellsite geology with remote geosteering. For further details on this contact us and we can discuss an appropriate service schedule to meet your needs. SSEC’s basic service level for remote operations is intended for wells with little to no expectation of unexpected geological challenges. These often include wells drilled with extremely detailed offset well control, in thick formations or exploratory wells intended for delineating formation boundaries. Our geosteering teams are employed primarily to monitor operations for the client so that the office geologist does not need to keep an eye on the Pason while the rig is in operation. Basic tier teams operate monitoring up to 6 drilling rigs simultaneously. This means they are not intended to have an active role in making wellpath adjustments but rather provide information as needed to another decision maker within the client company’s organization. The geosteering teams assigned to the basic tier are typically junior geologists with between 1 and 3 years of wellsite or remote experience and can be employed in teams of 2 for 24-hour monitoring or individually to cover only night time operations. During active operations, a geosteering snapshot that shows the likely location of the formation top relative to the drill path is provided every 4 hours via email to the client. Our standard remote geosteering package is our first tier of service that provide active guidance for drilling targets. It is intended to be used in operations where drilling is below 30m/hr on bottom ROP or where there is little expected change in formation geology. Standard tier geosteering teams operate no more than 3 rigs simultaneously and are intended to be used to monitor operations 24/7. They are the primary point of contact between the directional drilling contractor and the client geology team. Standard tier geosteering geologists have a minimum of 3 years wellsite/geosteering experience in either the target formation or one similar. This means our standard geosteering staff know your play and understand what to watch for while drilling. Our advanced remote geosteering tiers provides the highest level of service for challenging or rapidly drilled horizontal wells. Our most experienced staff is assigned to handle these projects. The reporting and end of project deliverables are identical between these two tiers, however Advanced+ customers are guaranteed to have each rig monitored by a dedicated geosteering team 24 hours a day. Advanced tier teams may at times monitor up to 2 rigs simultaneously if there is a less demanding rig that requires monitoring simultaneously. Standard tier geosteering geologists have a minimum of 5 years wellsite/geosteering experience in either the target formation or one similar. Prior to commencing operations your advanced geosteering team will go over your project objectives in detail and familiarize themselves with the project area. If the client cannot provide a detailed geological map of the project area, our geologists can create an interpolated formation surface using offset wells and local seismic data. Any data acquisition costs will be passed on to the client. We can also provide a secure web portal to display our geosteering process in real-time. During active drilling operations, regardless of what service level the client has selected, SSEC geologists are in constant communication with the drilling team in the field as well as the geology team in the client’s office. Any anomalous events that are outside of the predetermined parameters for the project will be communicated clearly and immediately with the client. This may include unexpected formation pinch outs, troubles with the data feed from the MWD tools or difficulty meeting drilling targets. Copyright 2014 Silver Spring Energy Consulting Ltd.